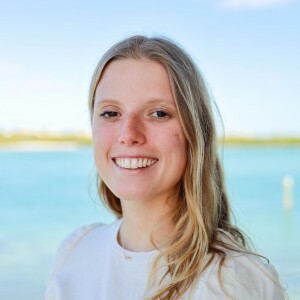 Katie joined Mote as a staff member in early 2018 after completing internships with the Coral Health and Disease program and the Ocean Acidification program. Katie has conducted several coral resilience experiments during her time at Mote. She has spent lots of time conducting research at Mote's International Center for Coral Reef Research and Restoration (IC2R3) as well as the Sarasota campus. Katie primarily studies the effects of ocean warming, ocean acidification, and infectious disease outbreaks on major reef building corals grown in the Coral Restoration program at IC2R3. She hopes the information gained from these studies will be used to conduct thoughtful coral restoration practices in the future. Graham, K.K., Eaton, K., Obrien, I., & Starks, PT. 2019. Anthidium manicatum, an invasive bee, excludes a native bumble bee, Bombus impatiens, from floral resources. Biol Invasions. 21(4),1089-1099.